Extension ladders will get you to high places, but they can crush or deform the delicate gutters that encircle most roofs. The Ladder Mount (#WCSLMNT) rests inside common 5- or 6-in. gutters to serve as a smash-preventing docking station for your ladder. 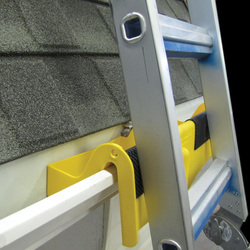 Constructed of rugged polypropylene, it protects gutters by distributing the ladder’s weight against the stronger fascia. It makes elevated work safer, too, with holes for a bungee cord (not included) to keep the ladder from slipping. A pocket in the bottom of the Ladder Mount accepts an extension pole or broom handle, so you can position it with your feet safely on the ground.